PJ 100 displayed at International Technical Fair in Belgrade 2001. In many respects the existing conventional plasma spraying torshes have reached thair technical and technological limits for further quality and cost advancement in plasma coating and plasma forming of near-to-net shape parts. 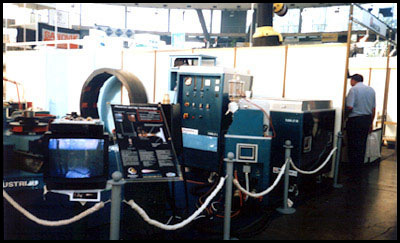 Plasma jet equipment was exhibited at the Belgrade International Technology Fair 2001. 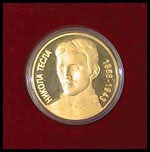 The same year inventor Miroljub Vilotijevic was awarded the gold medal Nikola Tesla by the Belgrade Association of Innovators and Authors of Technical Improvements for the original design of the plasma gun. Plasma Jet 100 has the power of 100 kW. It is completely automated, PLC regulated and it is the only commercially available mobile setup with such power. The construction of the plasma gun enables the production of plasma jet with a more homogeneous temperature profile, with greater thrust and length of the ejected plasma, compared to equipment developed by other companies. Such voluminous plasma jet of 100 kW enables good melting and acceleration of larger quantities of injected material than previously possible on some other commercial devices. High thrust of plasma jet produces higher rates of particle velocity, leading to very good adhesion to the surface. Thermal spray offers solutions for a wide range of problems. Depending on the thermal spray method and source material used, thermally sprayed coatings afford protection against wear, corrosion, fatigue, oxidation, and high temperatures. A broad variety of materials can be deposited as coatings. Metals, alloys, carbides, oxide and non-oxide ceramics, refractory metals, cermets (ceramic-metallics), and other materials can be deposited as coatings. Rapid spray rates are possible. 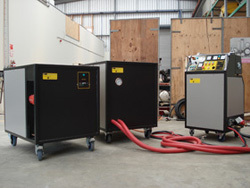 Thermal spray can achieve deposition rates from 1 to 45 kg/h (2 to 100 lb/h) or more. Many coating thicknesses are available. Thermal spray processes are capable of operating over a broad range of temperatures, deposition velocities, and atmospheric conditions—allowing for the greatest variety of source materials compared to other surface coating technologies. Coating thicknesses range from 50 µm to 6.5 mm (0.002 to 0.250 in.). Thermal degradation is rarely an issue. Because thermal spraying is a relatively “cold” process and substrates can be kept below 150˚C (300˚F), for most applications there is little risk of thermally degrading the substrate. Uniform coatings can be applied to parts with complex geometries. Robotic manipulation of both the part and torch facilitates uniform coating of multifaceted parts. Strong bonds withstand heavy mechanical loads. The bond between the coating and substrate, measured by tensile strength, is sufficient to withstand heavy mechanical loads in severe wear applications. Additionally, a diffusion heat treatment may provide further coating densification for challenging oxidation and corrosion applications.